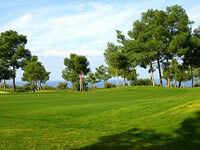 Golfing holidays have become extremely popular over the last number of years and North Cyprus is no exception. Golf is a rapidly growing sport and because of the great climate that North Cyprus experiences, golfers can play all year round. November to March is cool and provides the perfect weather for golfers. You may encounter the odd rain shower but they can be quite rare. In May the weather is much warmer and if you are intending on getting in a round of golf it is recommended that you choose early tee off times and avoid the midday sun. September and October again offer ideal golf playing weather. The Korinium Esentepe Golf and Country Club is the newest addition to North Cyprus. This is the first 18 hole international standard golf course to be built in North Cyprus and it boasts some amazing features. At this golf course you will find greens, sand bunkers, and the usual water hazards. The course itself is 6,600 yards long and is set amongst natural scenery making it feel like it has been here forever. Two man-made reservoirs water the greens and this helps to reduce any impact on the North Cyprus water reserves. This golf course also features a 30 bay driving range, a golf academy where you can take lessons, and a great clubhouse where you can relax and enjoy a meal. Golf carts are available if you need them too. The development is still not complete though and there are plans to include some course-side villas and a hotel. For those who prefer to play golf by the sea there is the Cengiz Topel Golf Course which is located near Guzelyurt. This course has two loops of nine holes, a total par of 70, and a total distance of almost 5,250 yards. This golf course is suitable for beginners and experienced golfers with numerous challenges including seaside holes. In some areas the greens are replaced with what is known as browns. This is a mixture of sand and oil and is a great surface for putting. The Cengiz Topel Golf Course is open daily and there is a nominal green fee which is payable. You can hire your clubs or bring your own. If you decide to play on a Tuesday or Thursdays you will also have the option of playing with local members. Golf shoes are required and you must also dress appropriately. This means no jeans or t-shirts. If a golf holiday is for you then you will need a hire car. After you have hired your car from us you can take your pick of golf courses. We do advise that you hire a car with a large boot so that you can carry your golf clubs. The 7 seater opel zafira is perfect and our most roomy car.